At its most basic, Ethereum is an open-source software platform based on blockchain technology. This platform enables developers to build and deploy decentralized applications (dapps) like Status or Metamask on it. All of this is possible because of a breakthrough in blockchain technology (as popularized by Bitcoin), and then Ethereum came along with some new ideas. As the two biggest cryptocurrencies (by market cap), Bitcoin and Ethereum often get mentioned in the same sentence. For the uninitiated, understanding what Ethereum is and how it differs from Bitcoin can be difficult. A decentralized platform that runs smart contracts: applications that run exactly as programmed without any possibility of downtime, censorship, fraud or third-party interference. Another common description of Ethereum is that it’s intended to become a “world computer”. If none of the above makes complete sense to you, don’t worry, that’s the purpose of this article. Think of this as Ethereum 101, wherein we answer all the most important Ethereum-related questions, chart its history, provide some technical explanations, discuss pros & cons, and lay out what the future might look like. If you’re completely new to cryptocurrency, it may be useful to get acquainted with some essential cryptocurrency terms first. As a starting point, let’s think of Ethereum as Bitcoin’s multi-talented, more versatile younger sibling. Let’s go! Ethereum started with one person, and that person is Vitalik Buterin. Unlike Bitcoin, Ethereum has a real name attached to it, a leader if you will. Buterin is a Russian-Canadian programmer and writer primarily known for his work with Ethereum and as a co-founder of Bitcoin Magazine. Involved in Bitcoin since 2011, he is also known as the developer of a fork of bitcoinjs-lib as well as one of the developers behind Egora, a cryptocurrency marketplace site. But Ethereum is what truly propelled Buterin to fame. He came up with the idea for it at the ripe old age of 19. Instead of returning to university (he was studying computer science at the time), he began developing it full-time after receiving the Thiel Fellowship. He now leads Ethereum’s research team, gives keynotes, and meets world leaders. He essentially lives on a plane, traveling to events and meetings all over the world, evangelizing and working to grow Ethereum. Buterin is an influential voice in the cryptocurrency world. You can visit his official websitewhere he sporadically posts articles or follow him on Twitter. Now that you know a bit about Buterin, let’s look at what he did. In 2013, while working on Bitcoin, he noticed that it lacked its own scripting language for application development. He argued that this was a huge opportunity that needed some action; when he failed to receive broad support for this idea, he began writing his own whitepaper. Released in late 2013, the Ethereum whitepaper outlines his vision to “provide a blockchain with a built-in fully fledged Turing-complete programming language that can be used to create “contracts”. These contracts he was referring to are the “smart contracts” that Ethereum has become famous for. A smart contract is simply a self-executing contract written into code that is stored on the blockchain. They render transactions “traceable, transparent, and irreversible” (more on this later). Buterin formally announced Ethereum at the North American Bitcoin Conference in Miami, January 2014. He’s said many times that he expected people to quickly point out all the ways in which he was wrong. But to his surprise, many people warmed to the idea and momentum started to gather behind his fledgling project. As credence was given to Ethereum, a nonprofit foundation, the Ethereum Foundation (Stiftung Ethereum), was created to guide development. This development was funded by a crowdsale that kicked off in July 2014. This was the first initial coin offering (ICO). Ethereum also introduced its own native token called ether (ETH). ETH is the currency which runs everything in the Ethereum ecosystem. During the ICO, the Ethereum Foundation distributed the initial allocation of ETH via a public presale, making 31,591 bitcoins (worth $18,439,086 at that time) in exchange for about 60,102,216 ETH. Late 2014 saw the buzz begin to build with more and more nodes (computers running the Ethereum protocol) coming online. In the intervening years, developers flocked to Ethereum to work on the core technology and build their own applications on top of its blockchain. According to State of the DApps (a not-for-profit curated directory of Decentralized Applications on the Ethereum Blockchain), there are currently over 950 projects running on Ethereum. The main technology itself has already run through a few versions with Metropolis 3.5 on the horizon. The ETH token also went from being worth mere cents to well over US$1,000. Countless ICOs (fundraisers) were held on the Ethereum blockchain and this trend looks set to continue for the foreseeable future. But there were, of course, some speed bumps too. One event, in particular, threatened to take the entire Ethereum project into the ditch. To understand the history of Ethereum you need to know the story of The DAO. DAO stands for “decentralized autonomous organization”, an entity that runs on rules encoded into smart contracts on the blockchain. Founded in 2016 by Christoph Jentzsch, one of these organizations (conveniently called The DAO) caused some serious waves. The DAO was a complicated smart contract whose aim was to create a decentralized venture fund that could seed venture capital into various dapp development projects. The code of The DAO was supposed to eliminate the need to trust humans in that it could function autonomously. But humans, as it turns out, were tough to remove from the equation. To understand how The DAO worked is relatively straightforward. If you wanted to influence the direction of development, you had to buy DAO tokens with ETH. To get funding, someone would present a proposal which was then voted on. To move forward, it was required to get 20% of the vote from all of DAO holders. The more money you’d put into the DAO, the more weight you held at the voting table. There was a lot of excitement around this idea and investors rushed to buy up tokens, investing over $150 million at the crowdsale (a record). However, no sooner had that happened than The DAO was attacked or otherwise hacked (what exactly happened is debated). On June 17, 2016, someone exploited a known loophole in The DAO (a vulnerability in the default smart contract code) and drained one-third of the funds held in The DAO. At the time, this was around $50 million. How exactly this occurred is beyond the scope of this article but if you’re curious, there is an excellent piece detailing the full events on medium. This was a dagger blow to a technology only a few years in existence. Ultimately, the Ethereum community decided on a solution that would, in effect, erase this attack. In blockchain parlance, a “hard fork” is “a radical change to the protocol that makes previously invalid blocks/transactions valid (or vice-versa) and as such requires all nodes or users to upgrade to the latest version of the protocol software.” You may also sometimes hear mention of a “soft fork”, a change to the software protocol where only previously valid blocks/transactions are made invalid. Hark fork: an upcoming software update will conflict with the current version of the network. Soft fork: an upcoming software update will not conflict with the current version of the network. The hack of The DAO resulted in a hard fork. The community voted to roll back history and make the record show that the attack never happened. This was a major change, and not everyone agreed. This proposal was controversial and it created the division that has resulted in two branches of Ethereum which are essentially two versions of the same original network. The Ethereum that we know today includes the majority of users and heavy hitters (including Buterin) who wanted to adopt an altered transaction history. On the other hand, there is Ethereum Classic, the vocal minority who didn’t like the idea. Ethereum Classic may not have gone on to the heights of Ethereum itself but it certainly hasn’t died either. Regardless of what you think of all this, it proved that Ethereum as a whole was resilient. With the most important historical points outlined, let’s back up and cover a few basics. Getting these core concepts down allows us to understand exactly how Ethereum works. Every time someone wants to send ether to another person or execute a smart contract, this entire decentralized ledger must record and confirm the accuracy of the event. This critical task is not carried out by people or a company, but by thousands of computers all over the world that are connected to the Ethereum network. These computers are usually what people are referring to when they say “miners”. The name itself is actually quite misleading; a more accurate term might be “transaction processors”. To make sure that transactions are securely and properly recorded requires computers to use a huge amount of computing power to solve complex algorithmic problems, and do so as quickly as possible to get a reward (paid in ETH). This is Proof-of-Work (PoW) and it ensures the integrity and vitality of the network as a whole. But PoW has some drawbacks, most notably that it consumes an enormous amount of electricity and is highly competitive. This has made it cost prohibitive for most people and arguably driven the power into a select group of mining pools. In other words, it’s become somewhat centralized. In August 2017, Buterin announced plans to move away from PoW. In the proposal (sometimes referred to as Casper), he stated that Ethereum would transition from pure Proof-of-Work to hybrid PoW/Proof-of-Stake. As opposed to the PoW consensus protocol, the PoS protocol validates transactions through the efforts of “validators”, “stakers” or “forgers” (people call them many different things) who put up their coins by locking them down in specialized wallets. With PoS, these parties/computers commit money to the system with the understanding that they will lose their deposits if they don’t follow the rules. Unlike Proof-of-Work, where the algorithm pays miners who solve mathematical problems with the goal of validating transactions and creating new blocks, Proof-of-Stake allows validators to place bets on which block they think will be added to the chain. If the validator is correct, they are rewarded (by a deterministic algorithm) in proportion to their bet or “stake”. The result of Casper is (among other things) meant to be a Bitcoin-style Proof-of-Work mining blended with a much-anticipated and still-experimental Proof-of-Stake system. This means that Ethereum will begin oscillating between the two, and ultimately become dependant on PoS to arrive at consensus across its network. Supporters of Casper hope the change will bring about a more eco-friendly protocol. Meanwhile, detractors point to the fact that its release has been pushed back numerous times as evidence that PoS won’t ever be truly successful on Ethereum. Others stress a more important issue, security (considering that the network holds billions of dollars of value). Developers have claimed that PoS will be more secure. At the time of this writing, Casper FFG has been released on testnet. FFG is scheduled to be implemented on the main network when the second half of Metropolis is launched, (The first half is called Byzantium and second half will be called Constantinople). Full-PoS Casper is still a ways off. But the first steps to getting Ethereum positioned for true scalability have been made. When you drill down, blockchains are really a shared version of reality everyone agrees on. So whether it’s a fully immersive VR experience, augmented reality, or even Bitcoin or Ethereum in the physical world as a shared ledger for our ‘real world,’ we’ll increasingly trust blockchains as our basis for reality. In the context of Ethereum, the blockchain acts as a public ledger that lists everything that goes on in the network in real-time. It’s the thing that makes the whole show possible. This distributed digital ledger of information can be easily synced across a large decentralized network. This is what makes Ethereum accessible to anybody with internet access, regardless of location. Within the Ethereum network, there are blocks of data that consist of transactions and smart contracts. These blocks are chained together and are the complete record of Ethereum’s history going back to its first block. These blocks are created or mined by some users and distributed to other users who validate them or make sure they are “right”. Every blockchain has some type of algorithm for reaching consensus. The network uses these algorithms to agree upon the single value of a data point across the entire system. As discussed in the section below, new transactions on Ethereum were initially agreed upon by “miners” using the same Proof-of-Work system as Bitcoin but plans to change that have been in the pipeline for quite a while now. Now, let’s take a look at some key aspects of Ethereum. One of the key innovations of Ethereum is the introduction of the EVM. Before the advent of Ethereum, cryptocurrencies were designed with a narrow range of function (sometimes this was completely singular). Bitcoin, for example, could only operate as digital currency. Developers had hit a roadblock; they’d either need to expand the functionality of Bitcoin onto the existing blockchain (very time consuming and technically challenging) or start from scratch with a whole new platform. Recognizing this impasse, Buterin stepped into the void, pioneering the EVM. this (the EVM) project focuses on preventing Denial-of-service attacks, which have become somewhat common in the cryptocurrency world. Moreover, the EVM ensures programs do not have access to each other’s state, ensuring communication can be established without any potential interference. That is just one aspect, however, so let’s try to clarify in simpler terms why EVM matters so much. With Ethereum, every time a program or transaction is activated the network has to process this. Contracts written in various programming languages are compiled into ‘bytecode’, which the EVM can decipher and execute (a bit like Google Translate). This means that anyone can run any program, regardless of the programming language given (and this is key) enough time and memory. All the Ethereum nodes execute contracts using their EVMs and this invention is huge because it allows people to build things in a more efficient way than ever before. Now every application can be built in one place; there is no need for an original blockchain for every new project. When you start learning about Ethereum, it becomes clear that the special sauce is its ability to power smart contracts. The phrase “smart contracts” was originally coined in 1996 by computer scientist Nick Szabo (rumored by some to be Satoshi Nakamoto). Smart contracts are computer programs that directly control the transfer of digital currencies or assets between parties, if certain conditions are met. Ethereum provides a base for these contracts because it is “software that can host other software”. This offers a level of functionality that many other cryptocurrencies simply don’t have. Ethereum is projected to have the ability to deal with things like identity systems, insurance payments, and management of permissions (to name a few). All of these are possible due to the smart contracts which sit on the Ethereum blockchain. They effectively stand in for a transaction or contract in an all-digital environment. This may all sound a little nebulous, so let’s look at a concrete example. Say we were to set up an Uber-type service. A smart contract could be written to track the GPS coordinates of someone’s phone. It could be designed in such a way that if the GPS reaches an intended destination, then the smart contract automatically pays out to another user whose GPS made the same trip (in theory, the driver). The driver could be paid $15 or whatever the reasonable fee is and this could all be done seamlessly without either party trusting each other or even really communicating for that matter. The driver has a guarantee of payment if, and only if, they deliver the other person to this specified GPS location. The potential magic of Ethereum lies in making daily life more efficient and cost-effective by automating everyday processes and removing middlemen from human systems. The above example of Uber is but one of thousands of possible use cases. To learn more about smart contracts, check out our articles “Digital Assets and Smart Contracts: A Beginner’s Guide” and “4 Reasons Smart Contracts Will Change The World”. ERC20 is simply the name for the standard requirements for anyone wishing to introduce a new token onto the Ethereum blockchain. ERC stands for Ethereum Request for Comments. Introduced in late 2015, ERC20 used to be unofficial guidelines until they became formalized on the Ethereum GitHub page. To paraphrase Coindesk, the primary reason that ERC20 exists is to ensure that Ethereum-based tokens perform in a predictable way throughout the ecosystem, such that decentralized applications and smart contracts are interoperable across the platform, and that all tokens follow a fixed standard of security. In layman’s terms, it’s so that new things work with everything else in the system. Given the huge number of ICOs that have taken place on Ethereum, it makes sense they’d want to develop some type of a standard. As of January 2018, there are more than 21,000 ERC20 token contracts and making sure they work across platforms and applications benefits Ethereum as a whole. As alluded to earlier, the ether token is the currency that makes the Ethereum ecosystem run. ether is a necessary element — a fuel — for operating the distributed application platform Ethereum. It is a form of payment made by the clients of the platform to the machines executing the requested operations. The cost of this fuel is determined by the degree of computation for an action the network performs — basically, everything costs a bit of gas, but some things more than others. This means that no one works for free and it disincentivizes inefficient code. Who needs ether? Any developer wishing to build something on Ethereum or anyone wishing to access an Ethereum-based smart contract should have ether. It can also be used as a currency. As the Bitcoin network slowed and transaction fees rose toward the end of 2017, some people turned to ether as a medium of exchange. 72 million ether created and given to contributors of the presale. 24 million ether created and given to the development fund, most of it going to early contributors/developers and the remaining to the Ethereum Foundation. 98 million ether (roughly) in current total circulation (at time of writing). In 2017, the issuance rate of ether is 14.75%, or roughly 5 ETH per block. It should also be noted that the issuance of ether is capped at 18 million ether per year (this number equals 25% of the initial supply). As we move into 2018, the introduction of Casper has been said to be “dis-inflationary” (i.e., inflation perpetually trending towards 0 but never reaching it). You should now have a basic idea of how the Ethereum blockchain, the ether token, smart contracts, the ERC20 standard and PoW/PoS consensus protocols work. For those who really want to dig into the engineering side of things, there is an excellent medium article on the technical nitty-gritty of Ethereum. Or you can always read the whitepaper. Perhaps the most exciting feature of Ethereum is the wide range of things it can potentially be used for. It may also be worth reiterating at this point that ETH was never designed to be a “currency” per se. Many people use it as a link between fiat currency and altcoins. For example, if you wanted to buy the Lisk token you’d need to change fiat currency into Bitcoin or Ethereum which are paired for trading with Lisk. Other people simply use it as the aforementioned fuel for the ecosystem. ETH is also traded and bought by speculators and investors who believe that the value of the Ethereum project and network of dapps will appreciate over time. So far they’ve been very right. ICOs – The lion share of ICOs that have taken place in the last few years have been located on the Ethereum blockchain. In terms of open-source projects and startup funding, Ethereum is clearly the preferred option. Dapps – Quite a few dapps have been built on Ethereum and more are joining the ranks. There is Augur, the decentralized prediction market; etherTweet , the uncensored, blockchain-based communication platform; TenX , an application that plans on letting people use ether pretty much everywhere; and Uport, the app that provides users with a way to take complete control of their identity and personal information. DAOs – Beyond the infamous DAO, there are other examples of decentralized autonomous organizations cropping up on Ethereum. The Dash cryptocurrency is technically a DAO, and the Digix.io token is another example. When you consider the future uses of Ethereum, the cliche “tip of the iceberg” really fits. If the technology realizes its potential, it could support programs that handle all manner of financial services, health information, organizational tools from A-Z, and a wide range consumer-facing applications. The potential use cases of Ethereum are really only bounded by one’s ability to be creative. Because Ethereum is providing a decentralized platform for dapps to run on, it enjoys all the groundbreaking benefits of blockchain. Immutable. The data written on the blockchain cannot be changed or deleted by any third party. Censorship-free. Ethereum apps are based on a network formed around the principle of consensus. This makes censorship nearly impossible. Secure. Protected by cryptography, the blockchain has proven thus far to be immune to tampering or hacking. There is no central point of failure (like so many other systems we have). Transparent. All records are publicly available for anyone to check; although privacy is rumored to be coming in the future, for now, everything is out in the open. Smart contract code isn’t perfect. The DAO was a prime example of how human error can lead to major problems. If a mistake in the code gets taken advantage of, there is no real way in which an attack can be stopped, save for obtaining a (quick!) network consensus and/or reworking the underlying code. Transactions on Ethereum aren’t that fast. While speed may not be its essential selling point, it can be frustrating in numerous different scenarios. Ethereum maxes out at about 20 transactions per second, while Visa can process over 1,500 transactions per second. Having read this far, you’re excited and want to get started. To run Ethereum, all you need to do is download an Ethereum client. Like other similar programs, the Ethereum client will connect to all the other computers running Ethereum the world over. By downloading and running the Ethereum client, your computer will become a ‘node’ on the network, running the aforementioned EVM. It will behave the same as all the other nodes running this software. If your interest has been sufficiently piqued and you want to buy some ether, it’s actually quite simple. All you need to do is step through the following process thereby creating a link between your fiat currency and an ethereum exchange. First, you need to create an account on an exchange. Coinbase is probably the easiest to use but it also tends to charge higher fees (more experienced people tend to use the GDAX exchange). There are many others to choose from: Binance, Kraken, Gemini, and Bittrex to name a few. Select one and create an account. Go through a verification process. Any reputable exchange is going to require that you verify your identity through a number of different methods. Expect to upload some documents, a few photos, provide a bit information and wait a few days. You can often start using an exchange instantly but to withdraw funds (beyond a certain limit) verification must be completed. Fund your exchange account with fiat currency. This is typically done through a wire transfer, a bank transfer or a credit/debit card (added fees for using plastic). The payment options accepted and the time it takes to go for the funds to go through varies by exchange. Begin purchasing ether. With signup, verification and funding all taken care of, you can get down to business. Every exchange has a slightly different interface, but most have YouTube tutorials that walk you through the process if you get stuck. Just go slow and be sure of every step you’re making. Once you’ve bought your tokens, you’ll probably want to move them off the exchange to a more secure location (we’ll explain how to do this in the next section). The trick to keeping your ETH safe is keeping tight control of your private key(s). What are these keys we’re referring to? Ethereum uses asymmetric cryptography (Elliptic Curve Digital Signature algorithm to be specific) to generate strings of numbers that act as “keys”. Your public key is generated by your wallet (and tied to your private key). It’s what you use to receive ETH, and also your address on the Ethereum blockchain. On the other hand, your private key is another long randomly-created string of numbers that allows you to authorize transactions of ETH. An easy way to think about it is your public key is like your account or routing number and your private key is like a pin. Treat them accordingly. Once you’ve bought your ETH, you have a few options as to where to keep it. You can leave it sitting on the exchange account, you can move it to a mobile or desktop wallet, or you can move it to an offline (“air-gapped” or “cold”) hardware wallet or paper wallet. It’s almost never advisable from a security perspective to leave money on an exchange. A mobile or desktop wallet is slightly safer but still at risk of being hacked. The most secure option is to move your tokens into a hardware or paper wallet and store them safely. Think of it this way: if you had $20, you might leave it lying in the cup holder of your car. This is like an exchange. If you had $1,500, you might keep it in your wallet or an envelope but you’d be very careful with it. This is like a mobile/desktop wallet. If you had $100,000, you would probably keep it in an insured bank account or safety deposit box. This is like a hardware wallet. There are many different wallets to choose from, but many people opt for the myetherwallet to start. If you want to go for tighter security, Ledger Nano S is a popular hardware wallet. Aside from making sure your tokens are in a safe place, be mindful of your personal information and be measured in how you speak about crypto online. Being negligent in either sense can also open you up to the risk of theft. Also be very careful when downloading or installing any wallet as there are more than a few phishing scams out there. To learn more about how your storage options, check out our guide to cryptocurrency wallets. 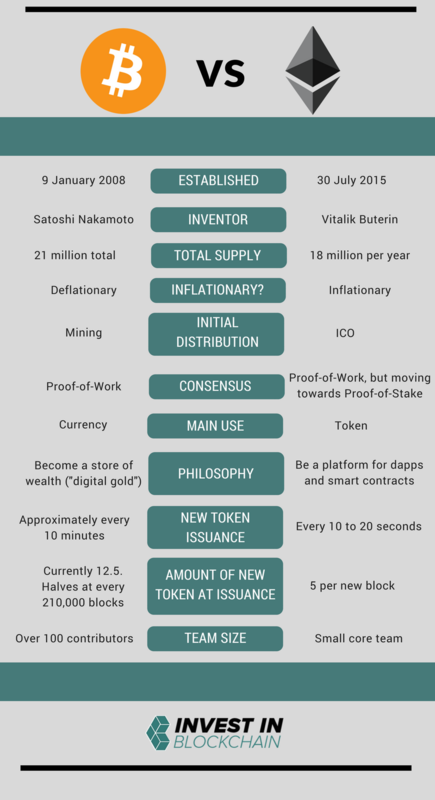 Bitcoin vs Ethereum: What Are The Differences? 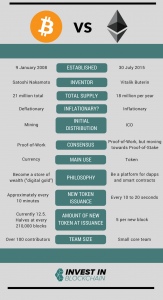 The differences between Bitcoin and Ethereum may be obvious by now, but let’s review some of the key points anyway. The biggest difference between these two giants of the crypto world is their goals. Bitcoin wants to become a store of wealth (“digital gold”) and a globally-adopted currency. Ethereum wants to become the platform on which decentralized apps and smart contracts run. Once you look at their features, BTC and ETH are not really direct competitors. They come from different generations and are different applications of blockchain technology. However, the popularity and rising market cap of ether bring it in competition with all cryptocurrencies. Particularly from a trading perspective, this means there may be a bit of rivalry. Ethereum has a lot of resources, the first mover advantage, a growing development team, and a good deal of momentum. But that doesn’t mean it isn’t facing a number of challenges. Although some people view the Ethereum Classic fork as a strong positive precedent for community decision-making, it was a definite hurdle. The painfully slow rollout of the PoW/PoS switch is another area where Ethereum is arguably struggling. Another challenge people often point to is the difficulty for developers to get involved with Ethereum. Ethereum is one of the leading blockchain development platforms in the world, but getting involved on a technical level is excessively hard. It takes a real strength of will today to be able to do the research and get a working app. But the biggest challenge is getting Ethereum to scale. Ethereum is still a long way off from being able to run an app with say 10 million users. This was highlighted by the release of the Ethereum-based game Crypto Kitties in November 2017. The idea behind this game is that the people can breed and trade digital cats for real money via smart contract. The kitties had a limited supply and a variety of “cattributes”, some exceedingly rare. People jumped at the novelty of this digital collectible game. Over $6.5 million flowed to the project and, at one point, it accounted for a significant chunk of traffic on the Ethereum blockchain. Crypto kitties slowed Ethereum considerably and revealed that it still has a long way to go before it’s ready for primetime. As the Ethereum blockchain keeps getting bigger, its inefficiencies have begun to show. This is a problem for anyone who relies on Ethereum smart contracts and it also impacts its future applicability and price. Solutions are feverishly being worked on, but how quickly they come and how successful they will be remains to be seen. Unsurprisingly, a number of other blockchains are also now nipping at Ethereum’s heels as they work to achieve similar goals. QTUM is meant to be is a bridge between Bitcoin and Ethereum functionalities in the form of a business-friendly blockchain. Just like Ethereum, QTUM has the capacity to approach smart contracts as well; but unlike Ethereum, QTUM has the advantage of reviewing what’s worked and what hasn’t and proceeding from there. Cardano was founded by original members of Ethereum. It is another smart contract-focused blockchain. They’re currently putting their energy on the scalability and democratized voting issues that have dogged Ethereum. NEO is often referred to as “China’s Ethereum”. They aim to digitize many types of assets which were formerly kept in more traditional means, and therefore make it possible to use them in smart contracts. Ethereum Classic is a hard fork of Ethereum, as we’ve discussed above. Although not as acrimonious as the Bitcoin vs Bitcoin Cash divide, Ethereum Classic is at odds with Ethereum and obviously now a competitor. They’re out to achieve all the same things, albeit with a bit less clout and a divergent codebase. Lisk is perhaps the Ethereum competitor flying the most under the radar. A smart contract and dapp platform, Lisk is pinning their success on the implementation of sidechains. In essence, they’re trying to address scalability and incentive structure issues from the start. By some measures, Ethereum is already wildly successful and there is simply no arguing that it’s already been a big innovator in the space. But where it goes from here is contingent upon quite a few different factors. Ethereum is steadily growing. But in recent weeks, crypto markets have been hit by a big downturn, with almost $200 billion in value knocked out of the market. This type of volatility is normal and likely to continue. In such turbulent waters, it is the technologies that hold real value, increase efficiency and solve real problems that are the ones that will stand the test of time. As a number of Ethereum-based tokens soar in value, the underlying asset grows as well. A lot of entrepreneurs and developers are going to need gas to use the network, and this could organically drive demand for ETH and increase its value. A handful of big companies like JPMorgan Chase & Co, BBVA, Accenture, Microsoft, and Intel have come together and have formed a group called the Enterprise Ethereum Alliance (EEA) which focuses on developing applications utilizing the Ethereum blockchain. As use cases for dapps continue to expand and the technology grows to meet the demand, Ethereum has the most evolved network to take advantage. The Ethereum community is smart, vibrant, and relatively sane (i.e. seems not to be as prone to mania or hype as other factions of crypto). In 2018, the door is wide open for blockchains that use smart contracts, like Ethereum, and I believe their potential market dwarfs that of “store of value” chains. Running down this list, one might conclude that the future is glittering for Buterin and co. That, however, is yet to be seen and there are, of course, naysayers too. Ethereum will not deal with network congestion quickly enough or their solutions will partially fail, causing them to be overtaken by a competitor. Vitalik Buterin is a single point of failure. Being the public face and driving force behind Ethereum makes him almost indispensable. If something happened to Buterin (or if he were to quit), this could be potentially devastating for the project. Many of Ethereum’s (and its dapps) use cases are theoretical or impractical. Some have argued that most of the ideas dreamed up on Ethereum are simply solutions in search of a problem. Community politics could turn toxic. Ethereum has already gone through one hard fork (more info and further debate here) and there is definitely potential for another to occur. The effects of this are hard to predict, but a similar type of discord and stalemate seems to be causing real problems for Bitcoin. As we’ve traced the history of Ethereum, broken down some of the key technical elements, and discussed its potential, hopefully it’s now clear how Ethereum functions as a base layer for decentralized applications. The dollar value of its built-in ETH token is subject to the supply-and-demand mechanics, just like in any other marketplace. If a lot of dapps get built and the value of the Ethereum network continues to be appealing to investors, the price should continue to steadily rise. But the opposite could happen too. Although Ethereum is old in crypto-relative terms, it’s still a technology in its infancy. This new way of approaching smart contracts is undeniably one of the most important innovations in recent years and everyone is waiting with bated breath to see how things turn out. How Ethereum evolves is perhaps the key to how quickly we will see the decentralized future that few of us can now fully comprehend. If it can live up to its promise, civilization itself may be running atop Ethereum in the not too distant future.